A proposal by the Archbishop of Canterbury, the Most Rev. 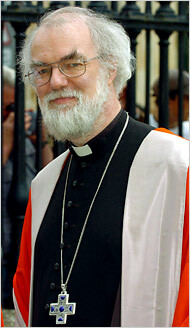 Rowan Williams, was hailed by conservatives. The archbishop of Canterbury called yesterday for Anglicans around the world to forge an agreement on issues that divide them, including the roles of gay clergy and women in the church, and suggested that the U.S. Episcopal Church could be relegated to second-tier status if it is unwilling to sign the proposed covenant. Leading conservative Episcopalians cheered the "Reflection" by Rowan Williams, head of the 75 million-member Anglican Communion, the worldwide family of churches descended from the Church of England. They said it could lead within a few years to the moment they have long anticipated, when the 2.3 million-member Episcopal Church USA is forced either to renounce its 2003 decision to consecrate an openly gay bishop or face expulsion from the communion. Liberals in the U.S. church noted that Williams did not specify what the covenant would say about homosexuality. They said drafting the document would involve lengthy negotiations and might result in a nuanced agreement the U.S. church could sign. And if the Episcopal Church could not join the covenant, some said, it might be content with some kind of "associate" status. "I don't see this as leading to the Episcopal Church being expelled. I see it as meaning we might need to sit on the sidelines for a time, and that's not necessarily a bad thing, because it would . . . allow us to set the divisive issues to the side and focus on our work, which is the Gospel," said the Rev. Tobias S. Haller, vicar of St. James Church in the Bronx and author of a liberal Episcopal blog called "In a Godward Direction." Williams wrote his Reflection in response to last week's General Convention of the Episcopal Church in Columbus, Ohio, where delegates elected Nevada Bishop Katharine Jefferts Schori as the first woman to head any of the communion's 38 member churches. Thirteen of the 38 do not ordain women as priests or bishops. The convention also called on U.S. dioceses not to consecrate any more bishops "whose manner of life presents a challenge to the wider church." That language fell short of a clear moratorium on installing more gay bishops, which conservative Anglicans sought. Despite his limited powers, Williams has sought to bridge the divisions caused by the consecration three years ago of V. Gene Robinson as bishop of New Hampshire. "It seems to me the best way forward," he wrote yesterday, is to draft a covenant on key theological and governing principles. Member churches that do not sign the agreement could end up with associate status, "still bound by historic and perhaps personal links" but "not sharing the same constitutional structures," he wrote. Conservatives particularly rejoiced over Williams's warning that no member church "can make significant decisions unilaterally and still expect this to make no difference to how it is regarded in the fellowship." Bishop Robert Duncan of Pittsburgh, leader of a group of conservative U.S. dioceses, said that "for the first time, the archbishop himself is acknowledging that some parts of the communion will not be able to continue in full membership if they insist on maintaining teaching and action outside of the received faith and order."